The relationship of the masticatory surfaces of the maxillary teeth to the masticatory surfaces of the mandibular teeth when the jaws are closed. In computer vision, the obstruction of a view. The retention of undissolved gas in a solid during solidification. A closing or shutting up. Adhesion of gas or liquid on a solid mass, or the trapping of a gas or liquid within a mass. The deficit in muscular tension when two afferent nerves that share certain motor neurons in the central nervous system are stimulated simultaneously, as compared to the sum of tensions when the two nerves are stimulated separately. the absorption of a substance from a gaseous medium by solids or melts. During occlusion, gases are absorbed by the entire volume of the absorbent rather than by the surface layer. In this sense, occlusion is similar to absorption, which is the dissolution of gases in liquids. The most common type of occlusion involves the absorption of gases by metals; for example, hydrogen is occluded by metals of Group VIII of the periodic table of elements. At room temperature, one volume of iridium absorbs more than 800 volumes of hydrogen, and one volume of palladium absorbs more than 700 volumes of hydrogen. The occluded gas interacts with the metal to form a solid solution; sometimes a part of the gas combines with the metal to yield other chemical compounds, for example, hydrides and nitrides. (also bite), the relationship between the surfaces of the upper and lower teeth when in contact. The various forms of occlusion are established only when all the permanent teeth are present. With normal occlusion, each upper tooth, except the central incisors and the wisdom teeth, must touch the corresponding bottom tooth and the tooth behind it when the jaws are in contact. The sagittal surface passes between the central incisors of the upper and lower jaws. There are four types of physiological occlusion. With orthognathous occlusion, the front teeth of the upper jaw cover the corresponding teeth of the lower jaw. Biprognathous occlusion is similar but with a more pronounced slant forward of the upper and lower teeth and of the alveolar processes. With a straight bite, the front teeth close on the edges of the incisors, and with an opisthognathous bite, the front teeth of both upper and lower jaws are inclined backward. Pathological occlusion, which includes overbite, decreases the chewing efficiency of the teeth. It may be a congenital anomaly of development of the dentomaxillary system or a result of tooth removal or jaw disease or injury. Gavrilov, E. I., and I. M. Al’shits. Ortopedicheskaia stomatologiia. Moscow, 1970. Kurliandskii, V. Iu. Rukovodstvo k prakticheskim zaniatiiam po ortopedicheskoi stomatologii, 3rd ed. Moscow, 1973. Fronts formed by the merging of cold and warm fronts. 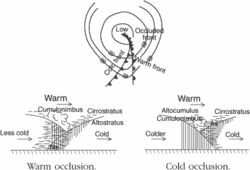 If a cold front overtakes a warm front, the result would be an occluded front. Also known as a frontal occlusion or an occlusion. See also front.